...Wilo Pumps & Agriculture Solar Powered Water Pump Power Increases Efficiency, Lowers Costs and Maintenance. We offer tailor-made solutions that work with you to create energy cost savings. Wilo Pumps and Agriculture Solar are dedicated to finding energy-efficient solutions for our customers and business partners. We focus on providing customized services to our clients based upon their unique needs, while always striving to put their best interests first. Whatever your water management needs, our pump energy solutions will work closely with you to find the most energy-efficient pumping solutions that make sense. Specific energy saving targets, significant CO2 reductions, and firm financial plans are the basis for Wilo Pumps and Agriculture Solar solutions. These factors have driven techincal progress and cutting edge innovations, which have characterized Wilo products since 1872. 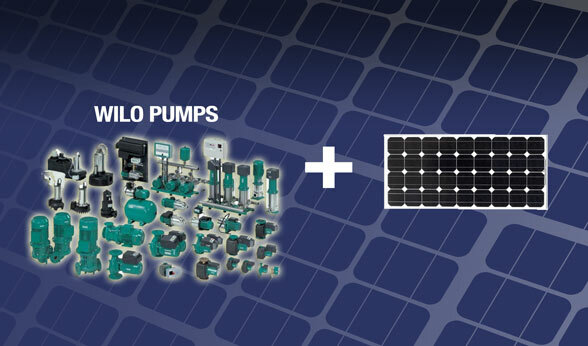 Wilo’s high-efficiency pumps and Agriculture Solar's power systems work differently than standard pumps. Rather than running constantly, our solution continually adjust to demand. At Agriculture Solar, Wilo Pumps and Agriculture Energies can be your simple water pump solution. Wilo has been in the business of producing pumps for 140 years. The many years of experience in power technology and extensive investments in research and development enable us to supply optimized pumps for low life cycle costs and top performance. We draw on all our strengths to support our customers with safe, efficient and sustainable solutions. Agriculture Energies systems have been dedicated to modern agricultural irrigation and successfully active in the top irrigation fields for over 10 years and continues to bring the tried and true principles and advantages of solar hybrid power. Think about it, and then make your move. Let Wilo Pumps and Agriculture Solar water management provide you with decades of reliability and lasting value. We invite you to explore the possibilities of our reliable hybrid solar powered pump solutions.